No matter what our station in life, we can all struggle with feeling unworthy. Though we may claim every person has intrinsic value, we too often link our worth to our performance or external factors beyond our control. We must see value in ourselves before we can see it in others. Our personal worth, our value, forms the foundation of our thoughts, behaviors, decisions and relationships, both personal and professional. We have intrinsic value that never changes; however, our perception of it can and does change. Jeff explains how we can all ENGAGE in our lives more effectively, EQUIP ourselves for success, EMPOWER ourselves for action and ENCOURAGE ourselves throughout every challenge we face. 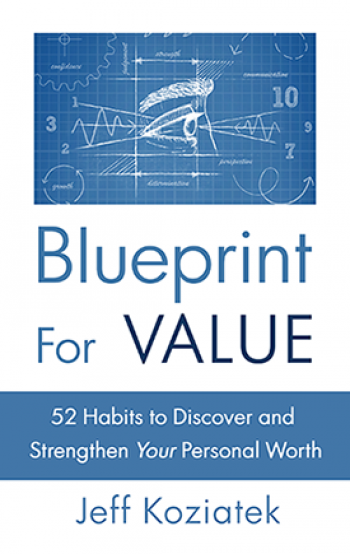 Blueprint for Value is a clear and concise guide that invites you to explore what’s going on beneath your stories and preconceived notions of self. The process gives the reader the freedom to comfortably dive into the concepts of personal worth and value. The book is divided into four categories (which is really helpful to me) that address your empowerment through different methods. I recommend this book to anyone who feels the call to heal, release and reframe old stories. There is a lot of encouragement and wisdom on each page. Jeff authors a clear and concise handbook for anyone looking to improve themselves to become the very best they can be. Ultimately this book provides solid suggestions for healthy living, and finding a foundation for genuine satisfactions in building a life. Great read, direct and to the point. Good investment of your time. I love it! What a great book! It is short, concise, applicable, and inspiring. Permission to quote excerpts or reproduce any portion.